In Maine I stayed at the Quaker Tavern B&B which is located in West Falmouth – just north of Portland. It's a B&B which has a delightful if slightly quirky host in Donna Little. Donna is a committed environmentalist and certified environmental leader, recycler (she's big on regifting as her shop in the adjacent barn evidences) and historical society stalwart. I think she's done a great job in conserving the house - keeping what could be kept and carefully reinstating what was too far gone to preserve. The building is described as a country federal structure. It was originally built by a family of Quakers (the Halls) and dates back to 1780. Having read the information on the website I asked if I could sleep in the room which has original wet plaster stencil decoration on its walls. It comes complete with genuine traditional cracks in the plasterwork and was simply wonderful! 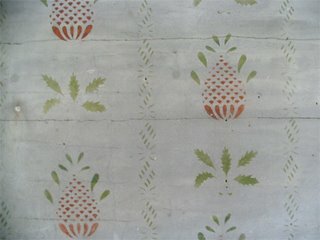 The stencil patterns suggest that it was originally done by Moses Eaton or his son - both well known for their stencil work in New Hampshire and Maine. The pineapple is the symbol for hospitality. 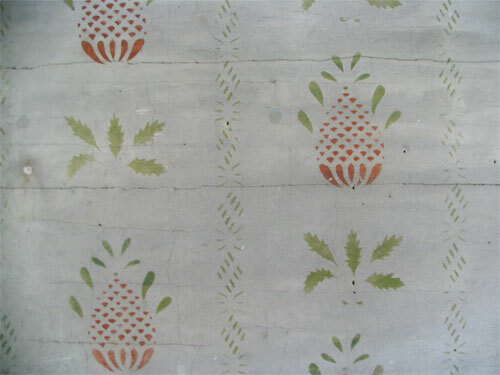 These stencils brought color and artistry to rural people eager for their plain walls to be transformed by red and green on backgrounds of salmon and raspberry pink, dove grey, sunny yellow and yellow ochre. Some stenciling appears on natural plaster or whitewashed walls or wood paneling; less expensive backgrounds, but still a way to afford the desired decoration. I've found a pdf brochure of a 24 page catalogue of Moses Eaton stencil designs. It starts with an interesting overview of the work of Eaton and Eaton Junior. 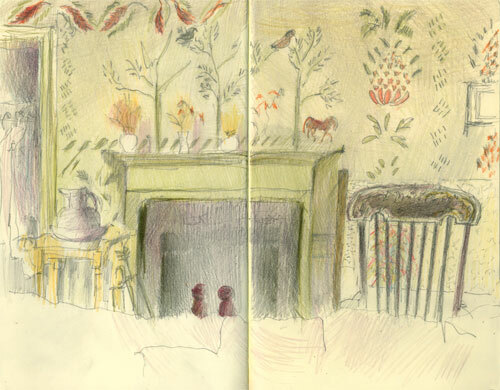 The stencil in the room I stayed in was very like the one on page 5 - except mine also had rather nice trees and a riderless horse over the mantelpiece. 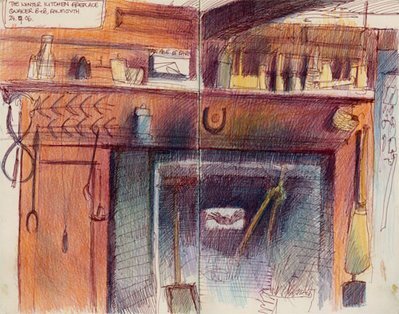 The second (see top) of the fireplace in the Winter Dining Room where I had Donna's organic environmentally friendly and cooked to order breakfast by candlelight every morning. The fireplace is HUGE and a wonderful warm and well worn colour. The B&B's website (see links below) provides details of the accommodation and surrounding land and services offered by the tavern. Many thanks to Gordon and Kathy for making me feel completely at home during the time I spent in their home, particularly on that Sunday and for the wonderful Sunday dinner cooked by Gordon. It was also really great to be able to spend time with Kathy and see her delightful artwork 'up close and personal'. I also helped her create her new blog called Labswork4Me - "dangerous tails" - an absolute must for any Lab lover!